Let me start off by saying that I had the most pleasant registration experience with Adidas’ KOTR event planner (Prime Creatives). To Jean & team, thank you so much for making the registration hassle free. It pays to be an adination participant and facilitator. So guys, you should join the adination running clinics in Bonifacio High Street (my home court on Thursdays, Ayala Triangle, Ortigas (nr UA&P), Ortigas (Tiendesitas & ULTRA – my home court on Fridays) and soon, MOA and UP. -Great singlet. Trust Adidas not to scrimp of the quality of their gear. Although the color is not much to be excited about (black), the material itself is good enough to forget about the color. -Flawless registration. As I said, I didn’t experience the hassle of registering for the event as the event planner went to each Adination group and personally attended to their registration and race kits distribution. The 10k and 21k runners merged somewhere near British school. I don’t know why they still insist on passing the place for big races. Bottlenecks will really happen. I really do not understand why water stations would run out of water. Is there no proven formula in estimating how much water to serve during races? Why can’t they just assume that 1 runner will consume 1/2 a bottle of water per station? A bottle of water would cost only P15. Based on the map of KOTR, they only had a total of 6 hydration stations. Assuming a runner would consume 1/2 bottle per station that would amount to only P45/runner, it’s a small amount compared to their P850 race fee. Now for my KOTR race recap. As I mentioned in my previous entry, I was worried about my performance during this race as I felt so out of shape and had very little training after the Disney Pikermi. My alarm rang at 330am and I was contemplating whether to get up to race or just stay in bed. Had I known I would be recorded as DNS, I would’ve just stayed in bed. Haha! Surprisingly hubby wanted to run so I had no choice but to get up to get ready. Hubby didn’t want to register due to the high fees but decided to just be my support photographer during the run. Since he will be running on his own, I decided to lend him my hydration belt as he knew it was not proper for him to ask water from the stations as he was not a paying participant. When we got to BHS, the parking was slowly starting to get packed. As we were rushing towards the starting line, hubby and I agreed to meet in Serendra where he will run with me until Buendia. 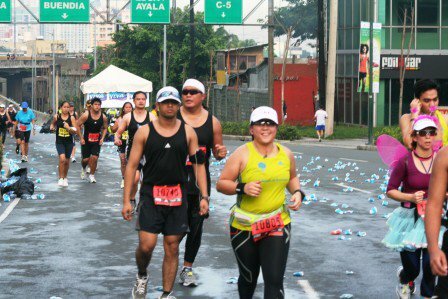 As I was finding me way to the pack of 21k runners, I chanced upon Mark Hernz and wifey Bea (beabear) w/ absentee runner, RJ & their pace buddies 🙂 Remembering that it was Bea’s 1st Pikermi made me really excited for her. I still remember my Condura Half Mary debut. It seemed like a long time ago. Be a told me that she was gunning for a 3-hour finish. In my head, I know she can do better. Since we were with the 8min/hour pace group, it took us awhile to get to the finish line after the gun started. It was a pleasant run by British School and towards the Kalayaan flyover. Most of my runner friends ran the 10k so we saw each other near the area where the bottleneck happened. I kept on glancing around to look for hubby. I hoped that he realized that we weren’t passing Serendra after all. By the time we reached Kalayaan flyover, I was worried that I might have missed him. And then I finally saw him. Yay! It’s game time. Noy & I ran side by side all the way to Buendia. It was a pleasant run. We chatted most of the way. You see, we normally train together. But since he moved to a new office, we barely had the time to run together. I miss those days. As I was crossing Ayala, Noy decided to stay behind and wait for me. They ran out of water already at the second Buendia station so he wanted to make sure he has enough for the two of us. I was still enjoying my run on my way back to Fort until we reached the first Buendia station. They had no water again. I still didn’t mind as I knew they had another station by the foot of Kalayaan flyover (Fort side). I just kept on going. Next water station, still no water. I was pissed! I lost Noy in the crowd. I knew he walked the Kalayaan-Buendia flyover ascend so I didn’t know how long was I going to wait if I decided to wait for him. I just continued on. I was parched. The sun was up and my energy was fading. I couldn’t consume the gels I brought with me since I didn’t have water. Lo and behold, I sighted a convenience store! Thank God for mini stop and for hubby’s emergency money, I was able to buy 2 water bottles but I had to wait in line. Precious minutes ticking…. Knowing that Bea was relying on the stations for water, I decided to give one of the bottles to her. No proper hydration for your 1st 21k spells disaster. And as expected no water again. This was the 2nd water station I passed after Mini Stop that didn’t have water so by the time I was heading back to BHS, I was feeling really thirsty. I saw Bea’s pace partners who I didn’t know by name at that time. It so happened that it was Miriam paced by Lit Onrubia (Chirunning Coach). Lit offered me a sip from his water bottle which I really was thankful for. We were passed McKinley Hill when I saw my missing support, Noy the hubby. I was so happy to see him. Well briefly as he was too tired to run with me. I was too tired to run but I had to finish this race. By the time we reached McKinley Rd, I just walked. I walked and walked, chatted and chatted with this fellow runner, Nick who was also too tired to run. About 300m to the finish line, we pushed ourselves to run the last stretch and then it hit me….CRAMPS! Never in my life did I experience cramping, well except for the cramps that only happens during a woman’s monthly visits. I used to ask hubby, how it feels. He said that the affected muscle has a mind of its own and that it will just lock in this flexed position eliciting pain. How clearly he described what happened. Nick kept telling me, go on. Don’t mind the pain. And go on I did and I crossed the finish line with a time of 2:49. Not my best, but one of my toughest. Whew! 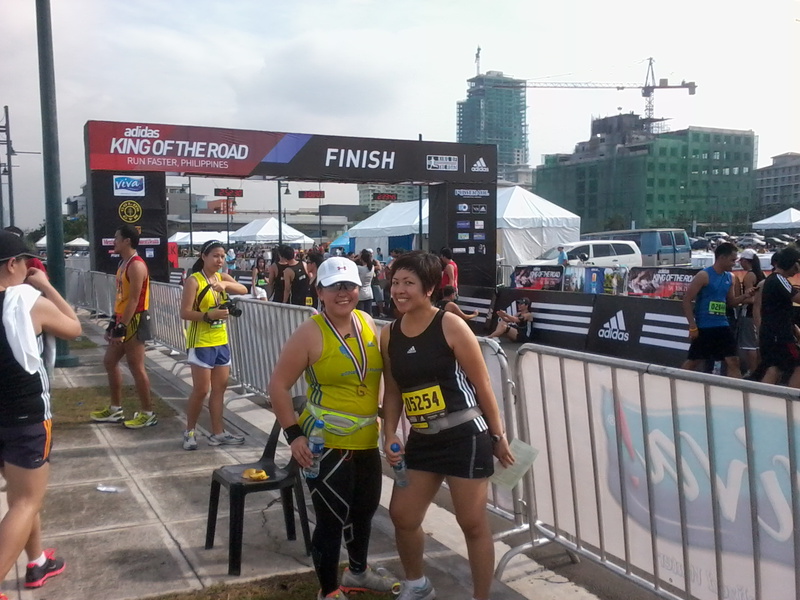 I looked around for hubby & Chie, walked towards the start of the finish area looking for Bea but I guess I missed her. After a few photo pops, we headed home. I was feeling too tired to socialize. A first in my book. I enjoyed the day with hubby. He also enjoyed his run. 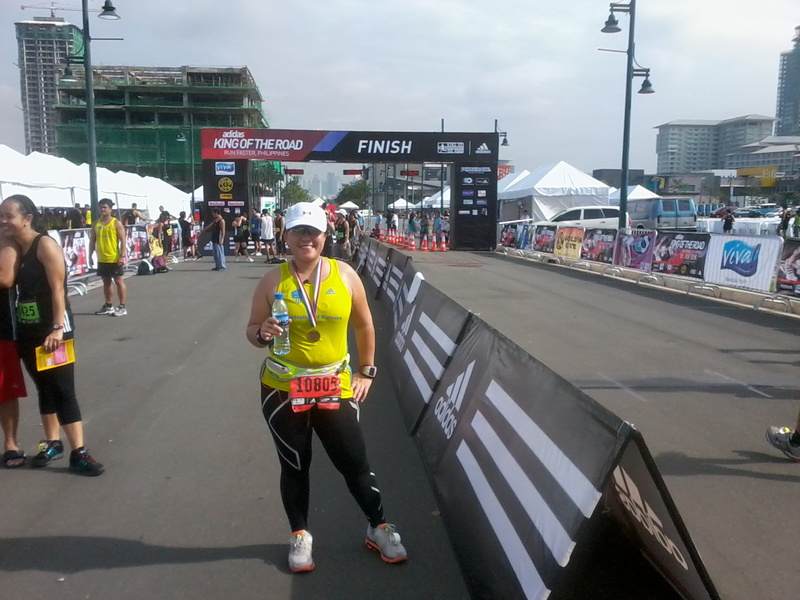 Chie wanted to do 21k but this was one race that I would not recommend her to run. First reason, her pacer (me) was too out of shape to help her and second, the lack of preparation from the organizers. I hope they learn their lesson for the KOTR 2011. 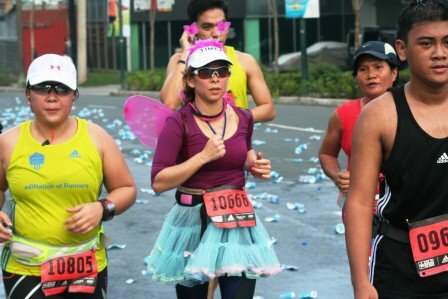 Mina-mani mo na lang ang half marathon. Kahit walang tubig kayang kaya!